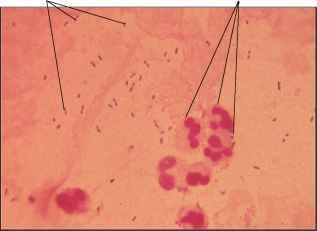 Figure 23.9 Streptococcus pneumoniae Gram stain of sputum from a person with pneumococcal pneumonia showing Gram-positive diplococci and polymorphonuclear neutrophils (PMNs). The inflammatory response to the infection often involves nerve endings, causing pain; the condition in which pain arises from an inflamed pleura is called pleurisy. Pneumococci that enter the bloodstream from the inflamed lung are responsible for three often fatal complications: septicemia, a symptomatic infection of the bloodstream; endocarditis, an infection of the heart valves; and meningitis, an infection of the membranes covering the brain and spinal cord. 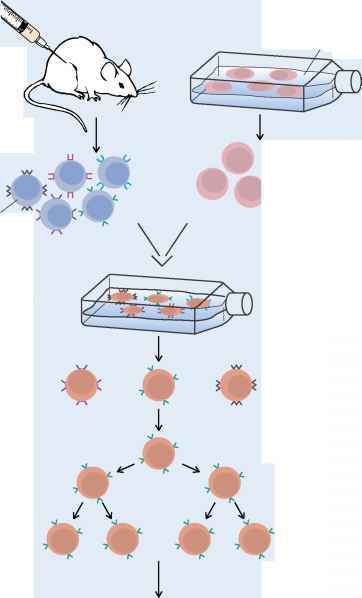 Individuals who do not develop such complications usually develop sufficient specific anticapsular antibodies within about a week to permit phagocytosis and destruction of the infecting organisms. Complete recovery usually results. Most pneumococcal strains do not destroy lung tissue.